In 2017, war tax resisters in Philadelphia, New York City, San Diego, Los Angeles, Ithaca, Asheville, Redway (California), and Phoenix jointly reported their tax redirection to resistance organizations led by Black, Brown, and Indigenous people in their local communities, as part of the Collective Redirection effort. About $20,000 was given away as a stand against white supremacy in the US government as well as in organizing communities. In addition, individuals and alternative funds gave away money, as they do every year, to many groups and individuals, with the intention of building a better world with these tax dollars than would be done if the money was given to the US government. 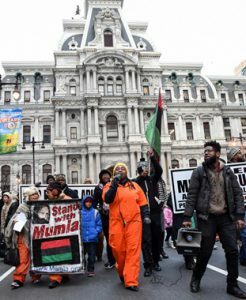 This year, war tax resisters in Philadelphia, New York City, San Diego, Los Angeles, Ithaca, Asheville, Redway (California), and Phoenix jointly reported their tax redirection to resistance organizations led by Black, Brown, and Indigenous people in their local communities to our Collective Redirection. About $20,000 was given away as a stand against white supremacy in our government as well as in our organizing communities. “Because of Sam’s encouragement, the Ithaca War Tax Resisters decided to give their money to two groups. One is called the Ultimate Reentry Opportunity. It helps people who are transitioning from jail or prison into the community. They are investing intentional time into fostering affinity, trust, dialogue and solidarity, which are key to dismantling the recidivism cycle. We are giving $1,350 to them. “Secondly, we are giving to the SHARE farm. This is members of the Cayuga Nation who were burned out of their villages around 1780 by the U.S. government because they sided with the British. They were driven into Canada. They are now trying to return to their traditional lands. They have 60 acres on the east side of Cayuga Lake. They are consulting with their elders about accepting the money. If they accept it, we will give $1,350 to them also. Thanks to everyone who organized this effort in your local area. Do you think this effort should be continued in the years to come? Let us know! Contact me at organizer@nwtrcc.org. Conscience and Military Tax Campaign Escrow Account (CMTC-EA) held a Granting Ceremony during the NWTRCC Gathering in St. Louis. Recipients of $1,000 grants each were St. Louis Veterans for Peace Local Chapter 61; Quaker Palestine Israel Network working in Ramallah; WeCopWatch; and a special donation to Oxfam America in honor of the St. Louis-based human rights activist Hedy Epstein, who died at 91 in 2016. Northern California People’s Life Fund gathered at the BFUU Fellowship Hall in Berkeley and gave out $32,000 in redirected taxes to 26 amazing peace and justice organizations. The evening program started with music by Kevbot with the Roots Rising, followed by a potluck dinner and the Granting Ceremony. Grantees included AfroCentric Oakland, 67 Sueños Program — Summer Mural Project, Longfellow Sanctuary School, Permaculture Action Network, Roots of Success (brochure for Employers to Hire Youth), and Bay Area GI Rights. 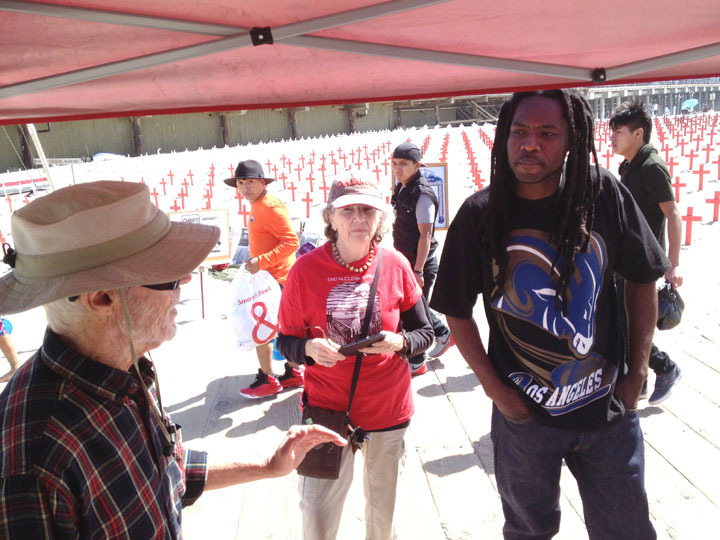 On Easter Sunday, April 16, the Southern California War Tax Resistance and Alternative Fund (SCWTR) redirected $6,000 in resisted war taxes to six local peace and justice organizations. The Redirection was held at the site of Arlington West, a project of Veterans for Peace, where crosses are placed to mark the deaths of U.S. military members in Iraq. Pictured (l to r), SCWTAF members Joe Maizlish and Frances Schneider-Liau talk with Phillip Lester, who represented the Youth Justice Coalition, which received a grant. Lester also placed a memorial cross for Christopher Murphy, a 30-year-old veteran of the Afghanistan War, who committed suicide just a few months ago in Concord, Massachusetts. Eugene Taxes for Peace! was a key organizer with other local groups of the local Tax Justice March on April 15 with a call to Resist Taxe$ Supporting War On Our Planet! Then on tax day April 18, the group held their annual vigil and rally in downtown Eugene, announcing a $500 tax redirection to groups including Planned Parenthood, Occupy Medical, KLCC local NPR station, and Cascadia Forest Defenders. NYC People’s Life Fund redirected $2,000 in monies donated by war tax resisters to local community groups in the New York City area doing work in our community that we would prefer our war taxes fund. This year the organizations were The New York Campaign for Alternatives to Isolated Confinement (CAIC); Desis Rising Up and Moving (DRUM) who work with South East Asian youth; Picture the Homeless; and the arts group Superhero Clubhouse. New England War Tax Resistance reported an unprecedented number of strong applications for grants, including from groups never funded before. $4,700 was divided among nine groups: Association of Haitian Women, Beantown Society, Cosecha, Keep It 100, Maine WTR Resource Center, Student Immigrant Movement, Traprock Center for Peace and Justice, Young Abolitionists, and Youth Justice and Power Union. Redirection to Black, Brown, and Indigenous Resistance! Black, Brown, and Indigenous People are directly targeted by systemic racism and state-sponsored violence. There is a huge wealth gap from the ongoing legacies of white supremacy and systemic racism that impacts households and organizations. In many communities, white organizers have access to more resources than Black, Brown, and Indigenous organizers. This is a chance to build and strengthen relationships between our movements. War tax resisters are showing up, and asking how we can support other organizers working for racial justice! Are you planning to collectively redirect tax dollars this year to Black, Brown, and Indigenous organizers working for liberation in your community? We encourage tax resisters to customize your organizing to your local community. Our communities are not monolithic so ground your work in your area! NWTRCC will provide support as well as gather information on how much was redirected in total. Want more information on this campaign? See the in-depth analysis below. This year, war tax resisters from around the country are taking on a new initiative, to collectively redirect taxes to resistance organizations led by Black, Brown, and Indigenous people. Together, we will refuse to pay tens of thousands of dollars to our oppressive government and redirect that money directly to organizations that are challenging the very foundations of oppression in our society. You can connect with other war tax resisters in your area by checking here, or by contacting Sam Koplinka-Loehr directly to learn more (organizer@nwtrcc.org or 607-592-7650). Here are two ways in which this new initiative is exciting and critically important to our movements. War tax resisters have been involved with movements fighting all forms of oppression for a long time. The National War Tax Resistance Coordinating Committee’s (NWTRCC) statement of purpose reads, “NWTRCC sees poverty, racism, sexism, homophobia, economic exploitation, environmental destruction and militarization of law enforcement as integrally linked with the militarism which we abhor. Through the redirection of our tax dollars NWTRCC members contribute directly to the struggle for peace and justice for all.” Our campaign, Divest From War, Invest In People, has worked to address these intersections for years. 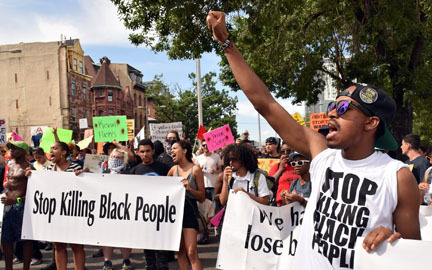 Our movements need to be working together more now than ever before, and more actively supporting the leadership of Black, Brown, and Indigenous organizers in our communities. We are facing the ongoing legacies of racism, militarism, and economic exploitation that are killing millions of people around the world. If we are to be truly effective, we must not only recognize our shared struggle, but actually figure out how to be in the struggle together. Our analysis has long understood the connections between systems of oppression. We know that our tax dollars fund racist wars against Black and Brown people—the wars overseas and the wars on our streets. Whether it is drone strikes killing 13 innocent people in Yemen, or the police murdering Brandon Tate Brown in Philadelphia, the US government is directly targeting Black and Brown people for destruction here and abroad. Alongside the ~45% of the federal budget that goes to the military, $9 billion goes to federal prisons and $14 billion to federal law enforcement. Police, prisons, immigrant detention facilities, and armed occupation are all vital parts of this racist system, and work in tandem. One example is the deportation of Latinx people who are crossing the border into the US to flee civil wars started by US secret operations in Latin America. Another is the ongoing incarceration of members of the Black Panther Party, a movement that threatens the very functioning of the imperialist war machine. Or native water protectors at Standing Rock facing off with TigerSwan security forces, a company employed by the Dakota Access Pipeline that also operates alongside the military in Afghanistan and Iraq. Perhaps no document has better articulated these connections than the Movement for Black Lives Policy Platform, which was released in 2016. In a damning analysis, it calls for a globally united movement for liberation; a movement led by Black and Brown people that sees US imperialism as operating around the world as well as against our own people here in this country. This call to action is powerful and clear. Our new war tax resistance initiative seeks to answer a piece of this call, refusing money to this racist, imperialist, and colonial government and redirecting it to Black, Brown, and Indigenous organizers who are working on the frontlines of change. At the national war tax resistance gathering in Florida in November 2016, a group of folks sat down to think through this initiative. A number of us brought it back to our communities as our redirection effort for the coming year. We decided that it makes most sense for war tax resisters to coordinate this effort on the local level based on our relationships with other organizations, and NWTRCC will help publicize the effort and gather information on the total amount that was redirected. Tax resisters have been engaged with struggles for racial justice in our communities for a long time. This is an opportunity to redirect resources to those fights and more directly support Black and Brown leaders in our areas. By having it be locally based, this allows each community to shape the effort in a way that works best for them. Our communities are not monolithic, and organizing looks different depending on where we are. What makes sense in Eugene, Oregon is different than in Philadelphia or San Diego. There are many avenues for moving this effort forward, again based on our relationships. Some communities are co-hosting workshops with other organizations to build solidarity between our movements and plan collective action. Others are meeting with activist organizations to encourage them to resist taxes and redirect the money to Black Lives Matter organizers in their area. Some tax resisters are actively involved in native struggles to protect the water and are organizing to redirect tax dollars to these fights. The main thing is showing up, being present at events and actions, and asking how you can support the ongoing work led by Black, Brown, and Indigenous organizers. We can no longer work against injustice while our tax dollars fund the systems we seek to dismantle. On the flip side, we can no longer refuse payment while not supporting the movements that are working on the frontlines. For Black and Brown people thinking about tax resistance, this initiative is a coming together that recognizes the need for a movement that is both calling out systemic racism and also challenging the government funding behind the police, prisons, the military, and occupation. For white people thinking about tax resistance, this is an opportunity to be accomplices, refusing to pay for our oppressive government and redirecting money directly to organizers who are targeted by our white supremacist system and are fighting for liberation. Even for folks who are not resisting taxes this year, there are other ways to be involved. You can put time and energy into building stronger relationships between movements in your area. Just as there is a huge wealth gap between white and black families based on historical and ongoing institutional racism, there is also a funding gap for organizations based on race. White groups generally have more funding and access to wealth because of systemic racism and generational privilege that often leaves Black, Brown, and Indigenous organizations doing more work with fewer resources. This initiative recognizes that the economic elements of systemic racism operate in our organizing communities, with many Black, Brown, and Indigenous organizers doing years of unpaid liberation work while white organizers have access to donations and foundation support. This is about showing up and building relationships between our movements. Redistributing resources can be one piece of that, supporting the fierce liberation work that is already happening in our communities, work that seeks to dismantle the very structures of privilege and oppression. NWTRCC will provide support to local groups as well as gather information on how much was redirected in total. This is an exciting new initiative to stand explicitly against systemic racism and militarism, while strengthening the connections between our movements.